FT8 - In 2018 it is by far the most popular digital mode for award chasing and working DX. It is described in this news story. The WSJT-X software can be downloaded from Joe Taylor's web site. Packet - One of the first "modern" digital modes, packet radio transmits data in groups or "packets" of 10s or 100s of bytes. This allows improved throughput and error control. The basic protocol for packet radio is AX.25. Transmission speeds typically range from 300 bps on the HF bands to 1200 and 9600 bps on VHF or UHF. PSK31 (or BPSK31, Binary Phase Shift Keying 31.25 Hz) Probably the most popular keyboard to keyboard digital mode today, PSK31 is normally generated and decoded using PC soundcards with one of many available software packages. PSK31 occupies very small bandwidths (approximately 100 Hz) and offers effective communication at low power. RTTY (radio teletype) is the original keyboard to keyboard mode, based on the 5-bit Baudot code, began with mechanical Teletypes as mentioned above. It is still a popular communications mode, but now uses PCs for coding and decoding, using 170 Hz frequency shift keying at a 45.45 baud rate -- 60 words per minute. Other Modes Many other data modes are available for experimentation, including Pactor and Clover that enhance packet operation, and MFSK, Olivia, Throb, DominoEX, MT63, and Thor which are other modes mainly for PC/soundcard operation. AMTOR is a special form of RTTY that provides error detection and correction. The HF Digital "Tower of Babel"
A thumbnail of ten digital modes. If you're an active packeteer, sooner or later someone will bring up the subject of TCP/IP - Transmission Control Protocol/Internet Protocol. "9600-Ready" Radios: Ready or Not? What the ARRL Lab says you should know before buying a VHF/UHF FM transceiver with 9600 baud capability. Software allows messages to pass between an amateur radio station and the Internet. A reduced-size 80-meter antenna designed for small lots, portable use, and the Warbler PSK31 Transceiver . PSK31 - Has RTTY's Replacement Arrived? 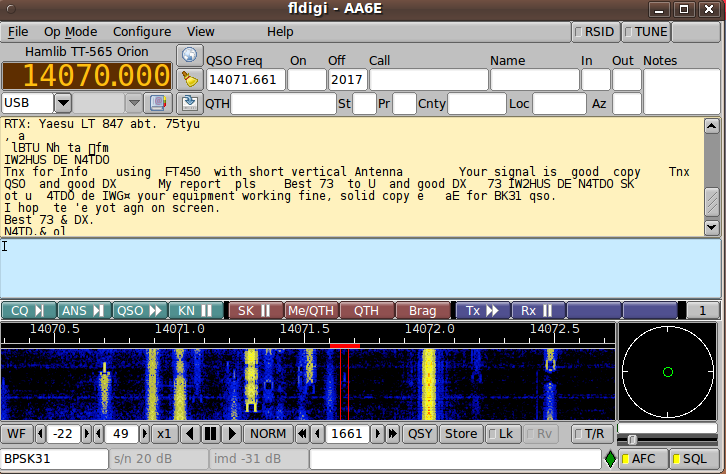 There's a new HF digital mode in town and the gossip is flying! A look at the technical side of this new mode. In early 1999 hams throughout the world discovered a new way to communicate using a digital scheme known as PSK31. Where do we stand today? Combine an inexpensive transceiver, some free software and you're on PSK31 at a rock-bottom price! Add to that the fun and pride of building the transceiver and you've got an irresistible package! "I'll see you in Hell!" Insult, or technical challenge? Just like RTTY and PSK31...only different. A computer, a sound card and a free download and you're in! Can't identify that mode? See "Digital Modes - Sight & Sound"
FCC descriptions of technical characteristics of digital modes. Click on a digital mode to hear a brief (most <100 kilobytes) sample of the sound these modes make. Welcome to the WinLink© Internet Site.